Here's another before and after shot from a real estate job. The house itself is not really anything special, it has a pool and small grassy area to the rear, which I thought would make a nice cover photo for the Realtor, instead of the boring front of the house. There are a few landscape lights visible, but they didn't provide much illumination of the backyard. I used four flashes for this photo, one off to my right and behind the camera, that's the main light for the red chairs, but some patio lights are near me too, which you can see by all the shadows visible at the chair legs. A second flash was placed at the right side of the pool, pointing back over towards the table and chairs in the center, and lighting the area above and below the patio, it also caused the column shadows, but that doesn't bother me. The third flash was placed near the red chair at the far right, and pointed at the grass and plants. The fourth flash location is behind the middle patio column, and pointed in the general direction of the table and chairs in the center, which provides some overall fill light to that area. The bottom shot was taken after I decided on the right composition, but before placing the lights. It took about 15 minutes to get the lighting placement right, and start shooting, then adjusting as necessary to get the final image you see on top. My final shot was taken at a slightly shorter (wider) focal length and cropped, that's why both are not exactly the same. In post I got rid of the typical greenish pool color and changed it to a more appealing blue. I also did the usual highlights/shadows adjustments, and cloned out a flash stand by the red chair. Specs for the image are: Sony A580, Sigma 10-20mm F/4-5.6 lens at 14mm, F/4.5, ISO 200, with a one second exposure. The Sony A35 body only and NEX-C3 with 16mm pancake lens can be pre-ordered now at B&H photo. I'm not sure when they'll ship, but if you want one soon make sure to get on the list. Both are entry level cameras, so if you're moving up from a point and shoot, the A35 would be a great choice, just make sure you get a lens as the pre-order is a camera body only. The NEX-C3 is a super small camera that'll fit in your pants pocket. Rokinon 35mm F/1.4 review Bonus comp at bottom! The Rokinon 35mm F/1.4 was unveiled in 2010 with much fanfare, and is now available for the Sony "α" mount. Samyang of Korea makes this lens, among others, but you may find it being marketed under half a dozen different labels. 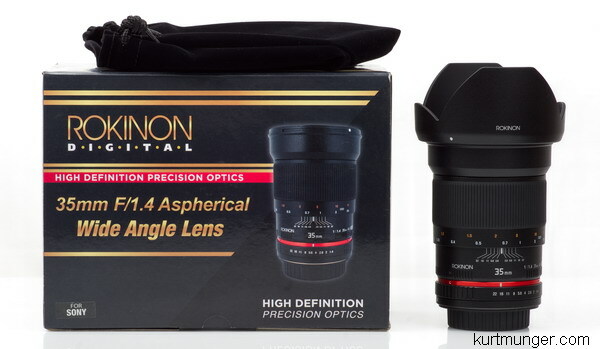 Optically speaking, the Rokinon 35mm F/1.4 lives up to the hype, with very high sharpness at almost all apertures, low distortion, minimal light fall-off at F/2, and no coma, even in the far corners at F/1.4! Probably the biggest drawback for most people is the fact that it's a manual only lens, meaning there is no communication between the lens and camera (Sony models), so if you aren't familiar with using full manual controls, you might want to skip this lens until your skills improve. The Rokinon 35mm F/1.4 is best used on a full frame camera; therefore, I can't recommend it for APS-C models. Why you ask? The Sony DT 35mm F/1.8 SAM (review here) is sharper in the centers at all apertures, and stopped down a little will match the mid-sections and corners of the Rokinon. Additionally, the Sony is very small and light-weight, with full auto focusing and metering, and costs less than half of the Rokinon. I've been bragging up the Sony 35/1.8 SAM since it was introduced, and you can see why by checking out the comp at the bottom of the review! Rogue flashbender and Gary Fong Lightsphere quick review. If you don't like the look of harsh lighting caused by your external camera flash, you may want to check out these two items. I bought the Gary Fong lightsphere a couple of years ago, and find it really works. I see wedding photographers use this thing, and it looks like a Tupperware bowl stuck on the end of your flash, but it's quite handy and and does a good job of diffusing the harsh light from a flash unit. The Rogue Flashbender is very different from the lightsphere, and can double as a snoot for directing light to a smaller area, without much light-spill. I don't find Gary Fong stuff particularly useful as I've tried the power snoot and a couple of other items that didn't work as advertised, but the Lightsphere is the exception. Reviews and articles coming up. I'm still trying to get the Rokinon 35/1.4 review finished. Due to the monsoon season here in AZ, (thunderstorms and overcast skies), I haven't been able to get the regular review shots together, but I'm still hoping to post it by early next week. Also, look for a quick review of the Rogue flashbender, and GaryFong lightsphere in a couple of days. Both items do a good job of diffusing a bare flash, but they aren't the same. A product shot how-to total update is now in the works, look for that next week too. An interior photography how-to article is about to begin, which will include lighting technics using off camera flash, how to set the scene, post processing etc. This flash is no longer available new, which is too bad, because it's feature-rich with plenty of custom functions, and of course works perfectly with Sony cameras. It has a fast full power recycle time of about 3 seconds, and at half power is almost instant! They're commonly available on eBay, and if you can get a good copy for less than $150 it's a steal. They also work well with Radiopoppers™ although you have to go through a power-up procedure before using. The HVL-F42AM was the first Sony designed alpha flash unit, the other two (HVL-F36AM and HVL-F56AM) were rebadged Minolta's. Links to stuff used in shoot below. A few people want to know what equipment I used to photograph the house front below. For this shoot I used four obsolete Minolta flashes, but I'd recommend the Vivitar DF-293 (review here) as an inexpensive flash, especially for off-camera use. Two 8' light stands were used with brackets, along with Radiopoppers™ triggers with adapters for the Sony hotshoe, but these may be just as good, and slightly less expensive, I'm going to check them out soon, and you won't need an adapter if you use a flash with a standard hotshoe like Canon or Nikon. You don't need Sony flashes with a Sony camera when using radio triggers. The last of the equipment used is the wonderful Sony A580 and inexpensive Sigma 10-20mm F/4-5.6 lens. Readers sometimes ask why I use a cheap lens and camera, as mentioned above, and not my A900 with CZ 16-35mm lens. For the lens, see the 7/4/11 entry below, and the reason I don't use the A900 is because it's overkill for Real Estate, (you don't need 24mp) and burning through a $2700 camera once every year or two makes no sense when you factor in what Realtors are willing to pay for a shoot. A Realtor called a few days ago and wanted some shots of this home, but they weren't sure about what subject would be used for the primary advertising photo. The house was nice, but most of the rooms had little or no furniture, and due to the way the home was situated on the site, the view from the street or front was nothing more than a big concrete driveway and three car garage. So what am I supposed to do? The first shot below shows a plain entryway, with some pretty weak looking cacti as a result of severe freezing temps over the winter months, unusual conditions for Tucson, AZ. I took the top shot shortly after arriving, but initially I wasn't very impressed with the view, and hoped for something with a little more 'pop' inside, or in the backyard. Unfortunately, clouds were rolling in, and the sun was mostly hidden, which wiped out the chance for decent outdoor shots; the inside was definitely upscale, but lacked furniture to really set it off. This is the problem with Real Estate photography, once you show up for the appointment, you sometimes have to make things happen, and can't inconvenience the Realtor or yourself by trying to come back at a better time. 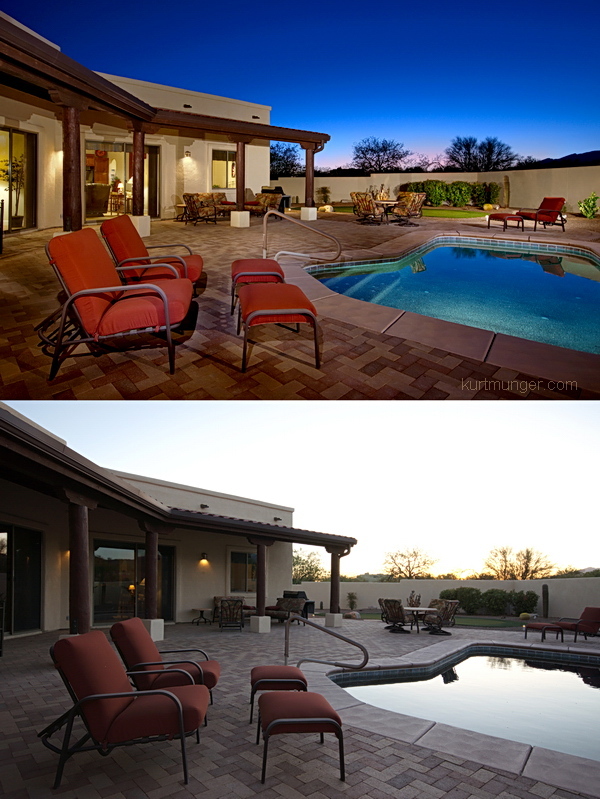 In both images below, the sun is low in the sky and behind the house, leaving the front in shade. The top shot was taken using the in-camera Sony A580 three shot HDR. I used a slight levels and colors adjustment, and rotated it properly. This image is what most Real Estate photographers would present to their client, not that it's bad, it just doesn't have any 'pop'. HDR (high dynamic range) photography is not good for scenes like this, because there isn't a huge difference in lighting. The problem here is the lighting is very flat, which makes the picture flat, HDR doesn't improve flat boring pictures, it only makes them worse by reducing contrast and wrecking color tones. The bottom image, (taken from a slightly different position than the top image) looks much better, and is a result of using four off-camera flashes. I placed a flash (1/8 power, 50mm zoom) with stand behind the column, high up and pointed down at the bottom of the entry door to bring out the rust color and ironwork. There's a flash (1/4 power, 50mm zoom) on my front right, placed on a wall, about 8' (2.5m) away pointed at the topped-off Desert spoon (Sotol) plant on the lower right. Another flash with stand is on the far left, almost behind the leafy bush pointed across the sidewalk at the prickly pear cactus, (1/4 power, zoom? ), see shadows. The fourth flash is hand-held, over my head pointed in the area of the roof tiles, (1/2 power, 85mm zoom), providing some general fill light to help match the second story with the entry area, it also caused the shadow below the roof beam, but I couldn't get the flash any higher, same for the flash on the left causing the cactus wall shadows. I spent about five minutes setting up the flashes for the shot, and took about ten shots to get the flash directions and levels correct. I think I made the best of the situation by taking a few extra minutes to make the picture stand out a little more, which also gives the Realtor a good cover shot to help generate interest in the home. Specs for the bottom picture are; Sony A580, 4 flashes, ISO 200, 1/160sec, F/8, 15mm (22mm equiv) with Sigma 10-20mm F/4-5.6 lens. I rotated the image, slightly adjusted the exposure, photoshopped a few messy areas, including the cactus to add missing pads and get rid of the discolored spots, and dropped in some green leaves to the small bush on the middle right. Four off-camera flashes, Sony A580. 70-300mm telephoto zoom comp page. A quick comparison page has been posted with the usual boring, but still useful stamp crops, put side-by-side, for those interested in the Tamron or Sony 70-300mm telephoto zoom lenses. 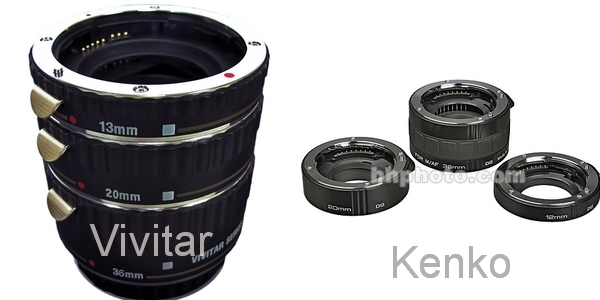 Both lenses have their pluses and minuses as far as sharpness goes, it all depends on the zoom setting and aperture. The Tamron is a little longer (things are closer) at all focal lengths than the Sony, but not enough to notice unless both images are directly compared. I always try to warn people about placing too much emphasis on sharpness. Accurate AF, focus hold buttons and focus limiter switches can be very important in action related photography. Tamron 70-300mm F/4-5.6 Di USD review. If you're looking for a high quality telephoto zoom, look no further than the Tamron 70-300mm. Generally speaking, it's about the same as the Sony 70-300mm F/4.5-5.6 SSM G, but costs half as much, and currently with rebate it's $399. While I find the build quality and optics on par with the Sony 70-300mm G, the Tamron's focusing system (on my copy) is not quite as fast or accurate, and the Tamron omits the often important focus hold button and focus limiter switch, that's probably why the Tamron costs half as much. Check out the review for more info. 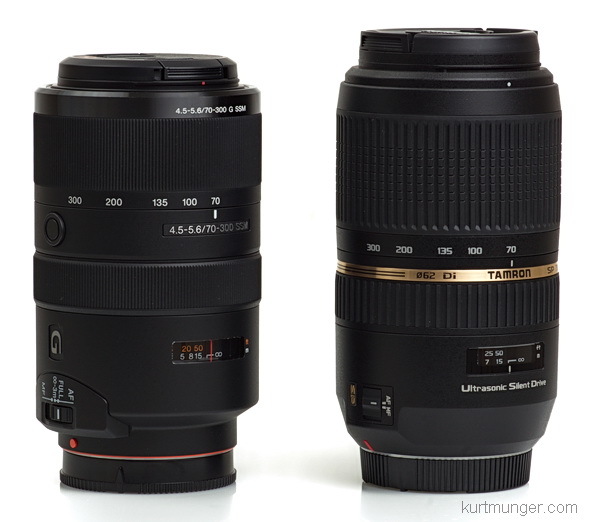 Look for a quick comparison between the Tamron and Sony 70-300mm lenses in a day or two. 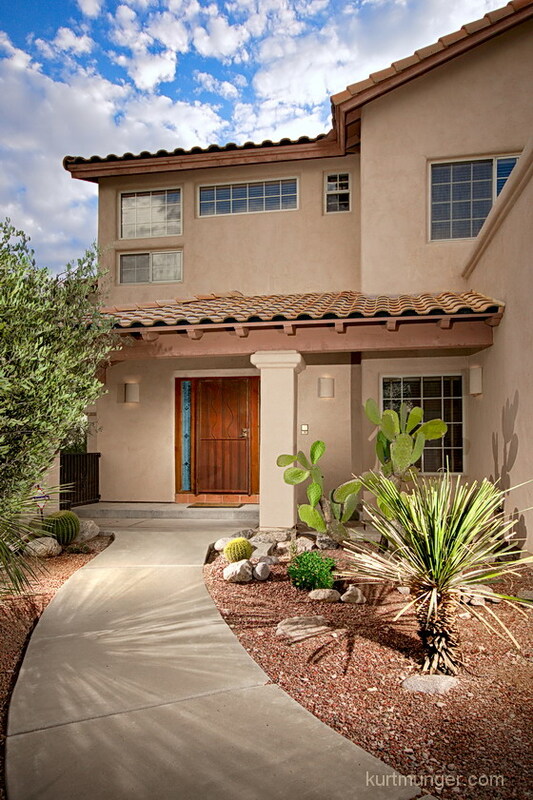 Here's a sample shot from a real estate job using the Sony A580 and Sigma 10-20mm F/4-5.6 lens. This bedroom was really small, but nicely decorated, with custom shutters that I wanted to highlight in the closed position, which worked out well as that would hide the house next door. Remember, you don't want to include anything that doesn't make the image stronger. The set-up required three off-camera flashes, and two 8' light stands. I used a flash on the far right, up high and pointed at the corner joint to bounce some fill light (I think 1/4 power, no gels or umbrella) to the right side of the bed and carpet. The second flash and stand was placed right beside and behind the camera position, bounced up high in the corner to add some cross lighting (1/8 power) which provides some fill to the foot board and diffuses the ceiling fan shadow. The third flash was put on top of a dresser on the left with a snoot (rolled up piece of construction paper) to avoid light spill, and pointed down and directly at the very dark fake fir bed throw, and to a lesser extent the purple pillow. The throw really soaked up the light, I think I used a half power blast from the flash unit! Running hard, undiffused light across textures like that really makes the details come out, and using a snoot (and pointed slightly down) keeps the strobe light from spreading to unwanted areas. The end result was is what you see below, after a little photoshop action. Due to the small room, I used a very wide 12mm (18mm equiv) because I wanted to get the shutters in the shot, and balance that extra area on the left with the bedside table and lamp on the right. This image to me looks a little too wide, but it's important to get certain details in a shot (like the expensive shutters), so I compromised a little in the interest of helping to sell the house, that's why they hire me right? I ended up cropping the image by about 300 pixels all the way around, did some minor highlights/shadows adjustments, and trimmed the white balance. The single image was shot in RAW. Specs are; F/9, 1/8sec, ISO 200, 12mm. I used F/9 instead of my usual F/7.1 to lower the value of the flash output so I wouldn't have to manually reset all three flash units. The Tamron 70-300mm USD review is almost finished, and will probably be posted by Monday or Tuesday. It's a great lens but has some quirks. Following the review by a couple of days will be the Tamron and Sony 70-300mm quick comparison, it's interesting and a little surprising. I've started the Rokinon 35mm F/1.4 review; so far it's great, but I didn't expect it to be so tough to focus properly around F/1.4-2 at less than infinity distances. Marc, from the Netherlands wrote me to point out a much cheaper alternative to the LED litepanels listed below. A place called CooLLCD has some similar LED devices, but costing less than half the price! Additionally, the HDV-Z96 can use Sony video batteries for super long life, as well as AAs. Marc says they were available at B&H Photo at some point in time, but they aren't right now. I've never shopped at CooLLCD, but assume it's a legit place. 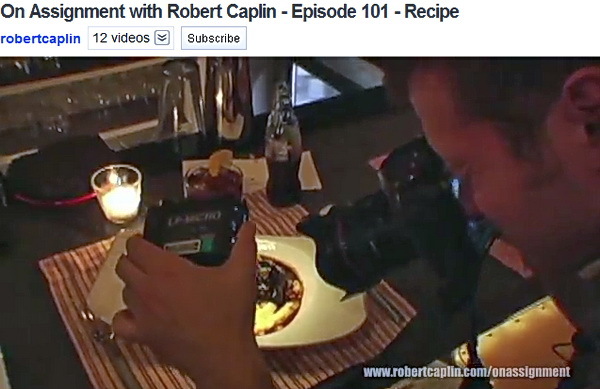 Check out this neat video from a big-time lifestyle photographer, Robert Caplin. The 89 second video covers shooting a specialty food dish at a NYC restaurant using a tiny, hand-held litepanels™ micro LED light, instead of blasting a flash and blinding customers, which is what I'd probably do. Litepanels™ look like pretty cool products, but I'm not sure how useful they are on a day-to-day basis. There's a large version, and a small version which you can probably stick in your back pocket. The second flash review covers a nicely built, small, and full featured Sunpak model. The PZ42X Sunpak is the same flash as Fuji re-labels and sells for their HS-20 and top-line X100 cameras, the only differences are the hotshoe style and price; the Sunpak model costs $145, the Fuji, $230. The Sunpak PZ42X is very similar to the recently replaced Sony HVL-F42AM. The Sony flash works great with Sony cameras, and using Radiopoppers triggers. The Sunpak has shortcomings that will probably make it a deal killer for most people. On the bright side; the back display lights up and looks similar to an old Pontiac red instrument panel. The Sunpak PZ42X flash unit for Sony doesn't work properly with Sony's live-view system; for some reason it defaults to full power blasts, and probably doesn't recognize the live-view mode; it thinks the camera is in manual mode. I have a feeling this flash unit was designed before Sony came out with its current live-view iteration. If you have an optical viewfinder Sony camera, this flash is almost as good as Sony's F42AM flash. Forget off-camera flash work with Radiopoppers, the Sunpak won't fire. I would not recommend this flash unit for Sony users on a budget, there are other options that work properly, like this model. Macro extension tubes for Sony. Recently I've had a few readers of the site asking if, and what kinds of extension tubes are available for Sony "α" mount lenses. There are a couple of choices that I can think of off the top of my slick head, the Vivitar macro extension tube set of three, $99, and a Kenko auto extension tube set DG, $179. I'm not sure if the Vivitar set supports AF, probably not, but both should allow auto exposure, with full aperture control. There isn't any glass involved, so image quality shouldn't be different between either set. AF isn't useful in macro range, so the least expensive tubes with aperture control would probably be my choice. I'll most likely be reviewing these sets in the near future, along with some after-market teleconverters. The last bird photos I posted, 6/11/11, were taken with the Sony 70-400mm, @400mm, with no TC, and they came out pretty good, with plenty of feather detail for being so far away. Yesterday, just for kicks, I tried a Sony 1.4x tele-converter with the same lens (equiv. to 560mm) to see if the results could be improved upon. I used the same set-up and the same focus point as the last shots, except this time I saved the images as RAW instead of Jpeg. The aperture starts at F/8 with the 1.4x TC, so I tried that initially to keep a higher shutter speed to avoid movement from the birds, but the DOF was real shallow, so I switched to F/10 and found it gave a higher number of sharp shots. I wondered if using the TC would really help in bringing out the fine details like the downy feathers on the birds. The 1.4x does help, but I would recommend trying to get the camera closer if at all possible. Unfortunately, my circumstances won't allow me to do that because I have to keep the camera in the shade to avoid a melt-down in the 110° (43°C) heat we have this time of year. The shot below was taken by my Dad while I was out of the room, using the Vivitar wireless shutter. Although some cloud cover kept the sun from really making this image pop, I still like it. Distance to subject is about 25' (8m). Specs are; Sony A580, RAW, ISO 400, Sony 70-400mm @400mm with Sony 1.4x TC, (560mm), F/8 at 1/250sec, no adjustments, only a crop. 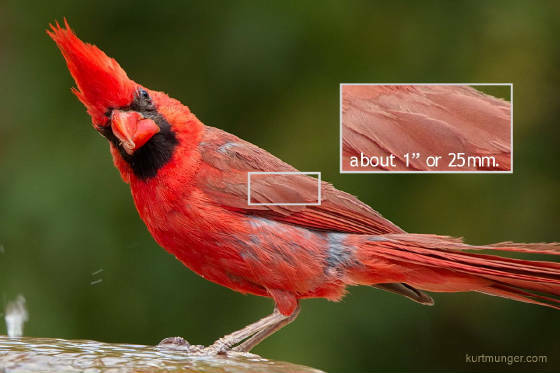 The photo inset is a 100% crop of the feather detail, click for larger image. I'm not sure if the image is in perfect focus, but the detail is very good considering possible heat shimmer and bird movement. Why I use a "cheap" lens. Quite a few people have written to me and asked; "why do you recommend and use the Sigma 10-20mm F/4-5.6 lens; it's cheap, and not the sharpest lens, even according to your own reviews." The answer is always the same; it does the job. In all the years I've used this lens, no client has ever complained to me about lack of resolution. They might complain about my prices and job completion time, but never resolution. When I submit photos to magazine editors, they never complain about resolution either. I've actually cropped an image in half to make a horizontal shot into a vertical for a cover photo with the 12mp A700, it turned out plenty sharp and looked great! As long as you make sure the lens is focused properly, and stop it down a little, everything will be great. Amateurs always think sharpness is the most important thing in a picture, but it's really the least important. If you have the sharpest lens, and slightly mis-focus, the shot is probably ruined. If your composition is poor, the shot is poor. If your light is bad, the shot is bad. When you're photographing something for a client, you don't want to worry about a lens that has a "wandering" focus setting, like the Tokina 11-16mm, (by "wandering" I mean the lens needs to be focused differently when changing focal lengths at less than infinity focusing distances; and has nothing to do with the AF problem on my review copy). The Tokina is much sharper at wider focal lengths than the Sigma, but the focusing issue is the biggest reason I wouldn't use it indoors, or recommend it for interior/Real estate work. The Sigma 10-20mm F/4-5.6 is very stable when focused at the infinity mark for any subject matter past 15' (5m) at all focal lengths, and that allows me to "focus and forget." Is that the absolute sharpest focusing point for all zoom lengths? probably not, but who cares, it's sharp enough to make my clients happy, and doing that helps free up time so I can concentrate on composition and lighting, which is far more important in making a great picture. When I have a tough lighting job ahead of me, I always pull out the Sigma and Sony A580, and keep the Sony A900 and CZ 16-35mm for back-up. The CZ 16-35mm focuses similarly to the Tokina, and doesn't have the great ghosting control of the Sigma. Sure, the CZ 16-35mm is sharp, but I don't really need the resolution. So the bottom line is; I use tools that I trust, and can count on to make me and others happy. The Sigma is cheap, but It handles ghosting very well, distortion is very low and manageable past 12mm, and is sharp stopped down a little at longer focal lengths, which I use most often. My average image specs for this lens are around 13-16mm at F/7.1, ISO 200. As I said in the review, if I didn't already have the Sigma 10-20mm F/4-5.6, I'd probably go with the new Sigma 10-20mm F/3.5, it has the same basic characteristics as the older Sigma, but is a little faster with better distortion control at the short end. It does cost more than the old Sigma, but I would pay the extra amount. 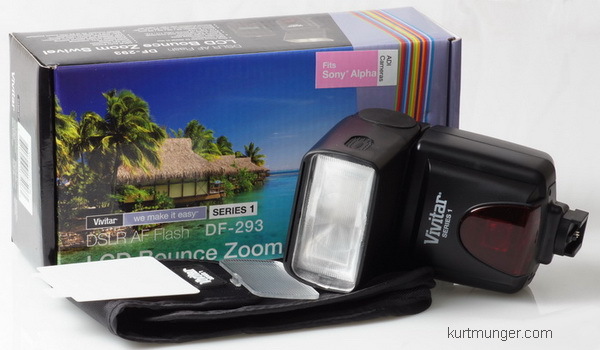 Check out the first flash review, covering the inexpensive Vivitar DF-293-SON. This little flash has five adjustable power levels, four zoom settings, along with a wide angle diffuser and bounce card! It works very well in manual or auto mode with Sony Cameras, the only drawback is you have to remember to manually adjust the zoom range when changing focal lengths. Why this flash? I wanted to add a few inexpensive flashes to my bag for those occasional times when I need extra lights, such as really big, multi-level, open style buildings etc. I have eight flashes now, but sometimes that's not enough. I was specifically looking for an inexpensive flash unit that had basic features such as adjustable zoom and power levels, and worked well with Radiopoppers™ triggers. I'm a manual control freak, so I don't need, or normally use fully automated flashes like you would get from Sony, those come at a higher price, and any additional cost can be problematic when you're looking at buying half a dozen flashes. The Vivitar DF-293 flash unit is about the least expensive you'll find that works well for off-camera use, like interior photography etc, but still gives good automated results¹, so it can be used for a walk-around flash as well². It's similar in power and zoom range to the old Minolta AF4000 flash, but it's smaller and has the proprietary Sony hotshoe so you don't need an additional adapter to mount it. It also won't shut down completely, it just goes to sleep, and wakes up with a shutter press or flash button press, even after a long period of non-use, that's really important because you don't want your flashes to completely shut off (like the Minolta AF4000) when you're in the middle of a time sensitive shot, or are far away from the flash unit. 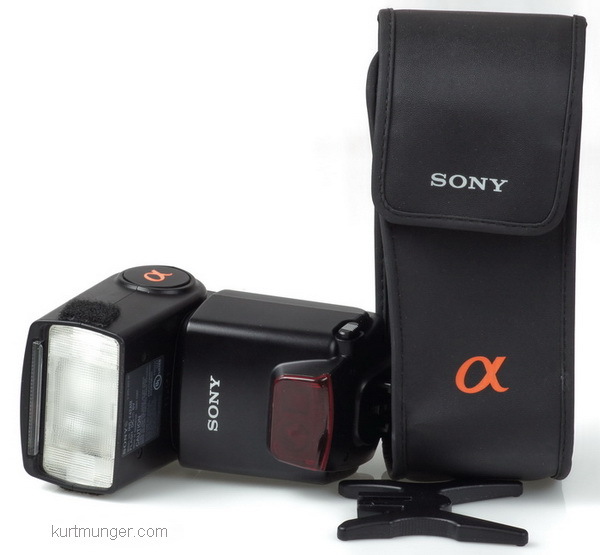 ¹If you want perfect automated flash control, stick with Sony flashes for Sony cameras. ²You must manually set the zoom range. The flash reviews won't be about how to use the flash, just as the lens reviews don't cover how to use the lens. However, they will cover the flash features, included items (like bounce cards, stands and diffusers), charge times, all specifications, actual output power, quirks, and other essential information. On the Nav bar is a new page called "Flashes etc" which has links to all the flash related items so far, (ok, only two right now), but the reviewed items will rapidly expand. Let me know if the first flash review has enough information for you. Remember; I'm not showing you how to use flash, it's about the features, characteristics and performance of the flash unit. Copyright ©2006-2019 kurtmunger.com. Reproduction in whole or in part without the express written permission of kurtmunger.com is prohibited.